It’s important to have a clear vision if you want to be a filmmaker who has staying power in Hollywood. 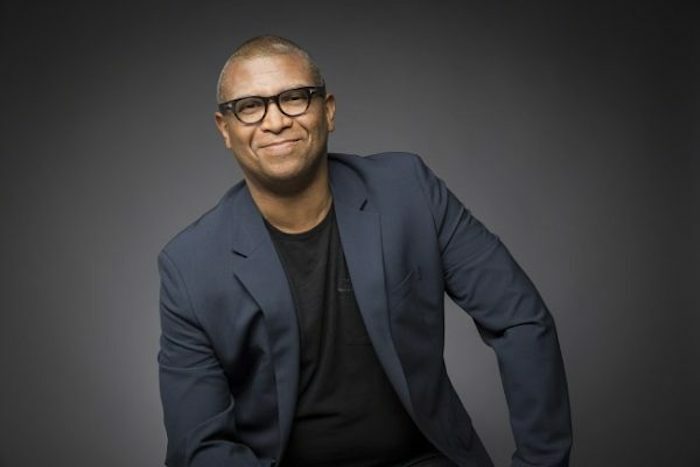 Veteran African-American filmmaker Reginald Hudlin’s passion for movies and crystal clear focus have cemented him as a perennial key player in the film and television industries. With hits like “House Party,” “Boomerang” and “The Boondocks,” he maintains a finger on the pulse of what’s culturally relevant at any given time. His latest film, “Marshall,” about Supreme Court judge Thurgood Marshall, opens on October 13 and stars Chadwick Boseman. Reginald recently took the time to speak with Atlanta Black Star about the film, as well as his career. Atlanta Black Star: You’re from Illinois originally? ABS: How do you think your roots affect your vision as a filmmaker? RH: That affects everything for me. At the end of the day, I make movies thinking about my friends and family back home. In the Midwest, people aren’t easily impressed. I remember going back home after making my first movie, “House Party.” We’d won awards at Sundance and had all this buzz. Then, I talked to one of my cousins and he said, “Oh yeah, I saw your movie. It was pretty good.” [laughs] At home, “pretty good” is a pretty nice compliment! ABS: Speaking about “House Party,” how did the story come together and how did you take it from a short to a feature? RH: I was showing it at different film festivals, and an executive from New Line Cinemas saw it and said, “Hey, let’s make a movie.” I had already written a feature film script version of it. Also, it was at the beginning of the explosion of black cinema. “She’s Gotta Have it” had come out. … There was an appetite for who might be next. ABS: What was the budget on the film? ABS: When did you first know you wanted to get into film? ABS: What would you say are your top five favorite films? Any genres. RH: Yes, Cary Grant. Rosalind Russell. I’ve seen that movie a lot. I think that’s a pretty amazing movie. RH: I took my daughter to go see “Singing in the Rain.” It took a lot of convincing to get her to go see it. We saw it at the Academy, on the big screen. I said, “Look, you’re studying ballet, you need to see this movie.” It blew her away. There was this great scene. … You just walk away saying it’s a really perfect movie. ABS: That’s four films. What’s your fifth? RH: I should name a foreign film. There’s a kind of obscure film called “Memories from Underdevelopment” from Cuba. I really love that movie. That’s my five. RH: They’re all very different. I could keep naming them! [laugh]) On my website, I have these lists like, here are forty perfect albums, here are the ten best musicals. If people want to see things I like, they can go on hudlinentertainment.com and I’ve got a lot of lists. ABS: Would you say there are any filmmakers who have influenced your style? RH: Oh, yes! So many. I really like filmmakers who are versatile, who can change up their styles. I really like Norman Jewison. He did “In the Heat of the Night,” then he turned around and did “Jesus Christ Superstar.” Those are two great movies. It’s really hard to have that kind of career today, where you can go into those different kinds of styles. Those are two movies that made a big impression on me. For “Jesus Christ Superstar,” I went to Catholic school growing up. It was a really good education, but I felt there were contradictions in what I was being taught in terms of the theological philosophy. “Jesus Christ Superstar” scraped away…it got back to the fundamental ideas that Jesus taught, made them relatable to a young person and I really appreciated that. And with a movie like “In the Heat of the Night,” if for nothing else, that scene when Sidney Poitier slaps the hell out of that old racist man. I mean, come on! What’s better than that moment, that’s the slap heard around the world! ABS: You went to Catholic school. Did that shape your vision as a filmmaker at all? RH: Yeah. East St. Louis is an all-black town, but I went to a school that was integrated. I think that’s good. In this world, you have to deal with all kinds of people. And, particularly, when you go to Hollywood, you have to be tolerant of other people while you’re asking others to be tolerant of you. Learning that at an early age was very important. ABS: Which do you prefer, writing, directing, or producing, and why? RH: I guess my favorite thing is directing, but, truthfully, I see them all as kind of one thing. Even if I’m working with someone else’s script, I’ll work with the writer to help shape it. And, producing, to me, is just an extension of what I’m doing as a director which is why, often, if I’m directing a movie, I’m a producer on it as well, because you have to manage the whole equation in your head. You have to understand all the parts to get the vision across the way you wanted to. ABS: How did you get involved with “Django Unchained”? RH: I was invited by Quentin Tarantino. We were friends and we were hanging out at a party and we started talking about movies about slavery. I mentioned how I really dislike most of them, with the exception of “Spartacus.” I thought that was a great movie about slavery because the slaves had a revolt. Years later he said, “Hey, I have a new script. Why don’t you come by and read it?” I read it and loved it. ABS: When you direct, is there any particular camera you like to use? RH: When I first started, it was still the 16mm era, going to 35. Now we’re into digital. I just feel like, you work with the technology of the moment and you can make something great with anything. You can make a great movie on your iPhone. Sure, you want to make the most beautiful images possible, but I think you can tell a story or make something beautiful in any medium with any device. ABS: What kind of changes, for better or worse, have you seen in the industry since you first started? RH: There’s an obvious shift in technology where you can stream movies anywhere, anytime. That dominates both film and television. The fact that people can see movies over and over again — or anywhere — that could be a huge advance, certainly for black filmmakers. People can access movies they may have been curious about but didn’t go to the movies [and see]. And they can have real data and say, “You know what, this person is a star and these movies are popular,” because you don’t have a few cultural gatekeepers making decisions. There’s a smorgasbord available to the audience, and I think that’s important. ABS: What actors would you like to work with that you haven’t? RH: I’ve been so fortunate to work with so many amazing actors. I think we’re in a great era where there’s a great new generation of stars popping up. Just the cast of this movie alone was amazing. To work with Chadwick Boseman, Josh Gad, Sterling Brown, Kate Hudson — these are all amazing actors, and I can’t wait to work with them all again. ABS: That’s a nice segue to my next question. How did “Marshall” come together? RH: Paula Wagner, who’s a producer I’ve known for many years — we were on the UCLA Film School Board together — she called and said, “Hey, I’ve got a script about Thurgood Marshall.” And I said, “Yes! I should read it, but I’m in!” I’ve always wanted to make a movie about Thurgood Marshall. Fortunately, it came my way. It was such a great script, such a refreshingly different take because it’s not a cradle-to-grave biopic. It’s not telling his whole life story. It’s one case, a case that most people don’t know about, so you don’t know the ending. The nature of the case is very relevant to today. I thought the circumstances of the trial were the same kind of challenges that we face today in dealing with the justice system. I thought it was a movie from the past that was very relevant to today’s audiences. ABS: How did you choose Chadwick? RH: We had met not long before. He had just gotten the role of Black Panther and I had been the writer of the Black Panther comic book for many years, so we just started talking naturally about Black Panther and we just kind of hit it off. I knew I was very excited about the idea of working with him. So, when this script came up I knew he would do a spectacular job, which he did. ABS: What message are you trying to convey with the film? RH: The movie has a lot of big ideas in it, but I think ultimately it’s about allies. If we stand up for something and link arms, we can overcome these incredible obstacles. We’re at a time when our country is literally being torn apart, and you can really lose hope. You can say, “Oh, my God. How are we going to fight for justice, for a fair system?” But, we’ve done it before and we can do it again. ABS: Why do you think film is important? RH: It’s a manifestation of our culture’s desires, aspirations, fear. It’s a collective experience. We all gather in a movie theater and we cry together, we cheer together, we laugh together. Then, if the movie really works, we talk about it. That’s what’s been so great about “Marshall,” because at every screening, I don’t care who’s in the audience — young, old, black, white, male, female — they have those same range of emotions and everyone has a great time talking afterwards. And that’s what I feel a movie at its best does, it brings us together. We don’t have to agree on everything, but we’re engaged and we’re involved, not just on an intellectual level, on an emotional level. ABS: Besides “Marshall,” what else do you have coming out? RH: We’re working on a revival of “Showtime at the Apollo” for Fox, and that will be launching next year. Pretty excited about that as well. ABS: What is your writing process? RH: If I’m writing myself, it’s just an idea I have, I start making notes to get things percolating. If I’m working with writers … In the case of this movie, there are two fantastic writers. It’s more of a case of sitting down with them and talking about my first impressions. I think first impressions are very important because the audience sees it for a first time. They don’t get to see it five or six times. We talk about what I loved from the very first time, where it didn’t work, then we start talking about it. If I was just going to the movies to see a movie about this, what would I really, really want to see? We’re in the dream factory, so we have to make dreams come true.